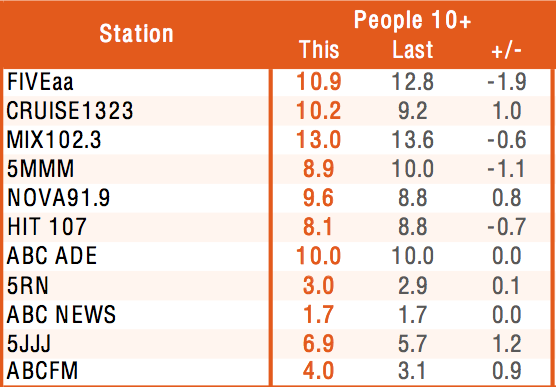 Low profile classic hits radio station Cruise 1323 has moved into third place in the latest ratings survey, with FIVEaa and Triple M both taking a hit. The AM station joined Triple J as big movers in the penultimate GfK radio rating survey for 2018. Mix 102.3 remains Adelaide’s top rating station, with 13 per cent of listener share, with FIVEaa holding its second place (10.9) despite losing ground (down 1.9 percentage points). Cruise moved up from fifth to third (10.2) leapfrogging ABC Radio Adelaide (10.0) which was unchanged, and Triple M, which lost share. Cruise is now the equal favourite station – with ABC Radio Adelaide – among people aged 55-64. The survey showed a continued rebound for ABC Radio Adelaide’s breakfast shift, hosted by Ali Clarke, after a mid-year slump. Clarke increased her share to jump Mix into second place. 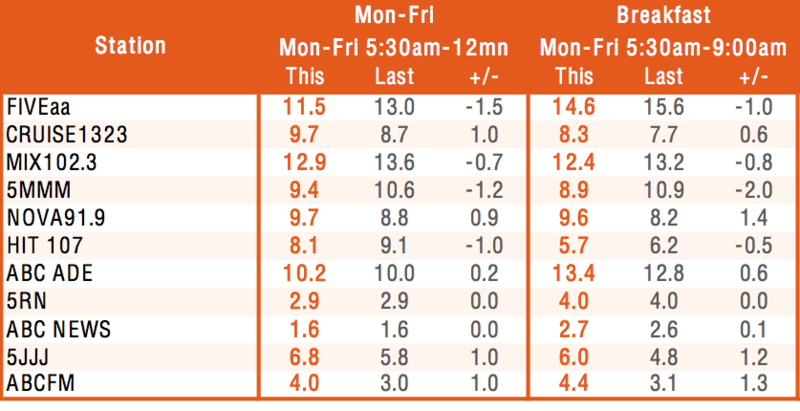 David Penberthy and Will Goodings from FIVEaa retain the number one spot in breakfast, despite losing share. Cruise’s success was based on improved showings across the schedule, with its morning program increasing its share by 2.4 percentage points to hit second spot behind Mix. Cruise has also become a weekend favourite, second only to Mix. Mix is the daytime leader – owning mornings, afternoons and drive. With the end of the football season, both FIVEaa and Triple M lost ground with their sports drive programs and on weekends. FIVEaa’s lineup of Jon Blake followed by Jeremy Cordeaux retains the lead in evenings, with Nova improving to take second place from the ABC’s Peter Goers. The ABC’s youth station Triple J had the biggest overall increase in listener share, but remains behind all commercial rivals.